Chanel ought to give my friend Catherine at Aesthetic Alterations a commission, because when I saw her wearing their new nail polish, Peridot, I knew I was going to buy a bottle of it myself, asap. Peridot is a green-gold that changes with the wearer's movement, looking different at every angle. The Chanel rep at the beauty counter only wore one coat and it looked more gold on her, but I put on two coats to get the full effect. It's a very unusual shade, a color not already in my nail polish collection, and Peridot is my birthstone, so I couldn't let this one get away. It's already sold out in Manhattan. I lined up recent purchases and old favorites and found that I won't need to buy nail polish for awhile, these colors will easily take me from summer straight into fall. Do you have a color or brand you love? Please share! Love the new Chanel. Very interesting color! And you know I'm CRAZY for nail polish. My fave brand is OPI. Just yesterday I replenished my favorite coral of all-time: OPI on Collins Avenue. I also tried CND quick-dry gloss topcoat, and it was super. You should see how many bloody nail products I have. It's sick. I haven't been this excited about a nail color in a long time...this is gorgeous! I think I will get on the phone and see if I can find one in San Antonio!! Beautiful! And your pictures capture the color far more perfectly than mine did. I'm glad another person finds it the most amazing shade! I never tire looking at my toes (and fingers when it was on them)--which is a rare thing. The complexity is beyond the norm. I see you have Black Satin. I wish I had that one. I got the more recent Black with a matte finish--not that I care about the finish, since I seal my polishes with a top coat--and it unfortunately has a horrible texture. It makes me sad since black nails are so very elegant. The peridot is a nice addition--are there touches of blue in it as well? Or, am I seeing things? Hi Vahni, I want to check out that OPI shade you mentioned. I like that brand too but I don't own any (yet). How many polishes do you have? I went and checked my own stash, I have about 15 and some are looking like they need to be tossed. Time to clean the nail polish closet! Hi Adrienne, another vote for OPI, I must find a good place to buy them. The beauty supply closest to me sells them, I think, I will check on my next visit. I really like those navy colors too. I have one by Revlon and I'm convinced they were knocking off a similar shade by Chanel. 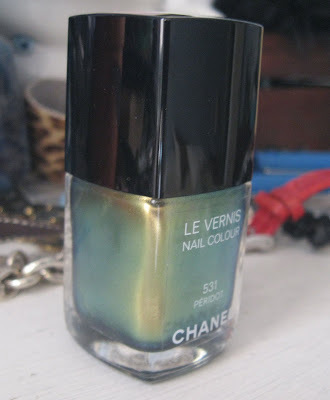 I normally can't justify Chanel polish, at $25 a pop, which is why I'm an Essie or Revlon gal. Good for you for sticking to your spending freeze. I need to join you in that. Hi Pam, did you find the Peridot in San Antonio? If you buy it, let me know what you think! 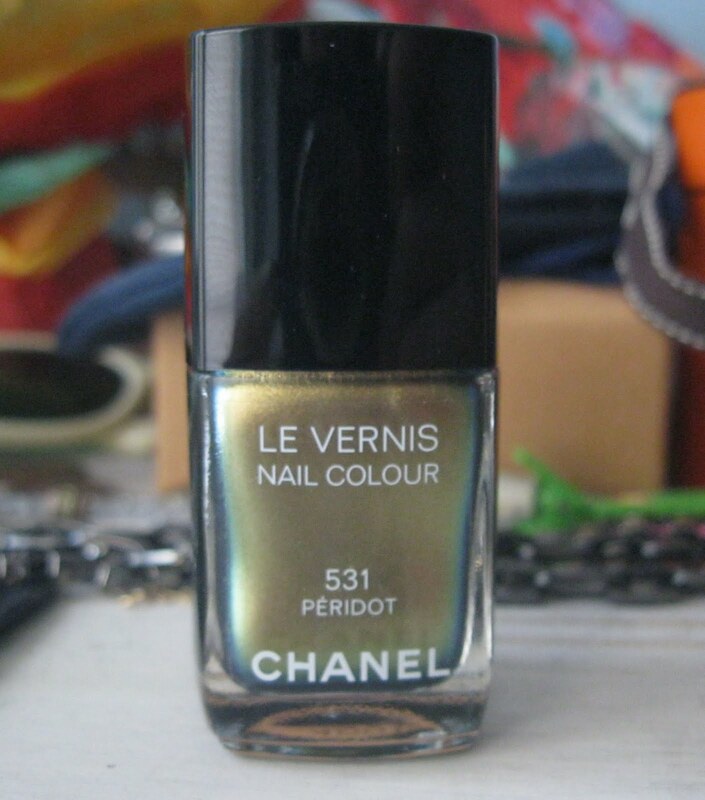 Hi Catherine, did Chanel put out that Black polish with the matte finish you mentioned? My Chanel rep told me they were coming out with a line of matte lipsticks and polishes for fall, but I am not into that look. The Black Satin is a really gorgeous shiny black, not Goth at all. I think it's a color they carry all the time. If you lived closer I'd give you mine to borrow! Hi Terri, the Peridot does have blue in it--in the bottle. 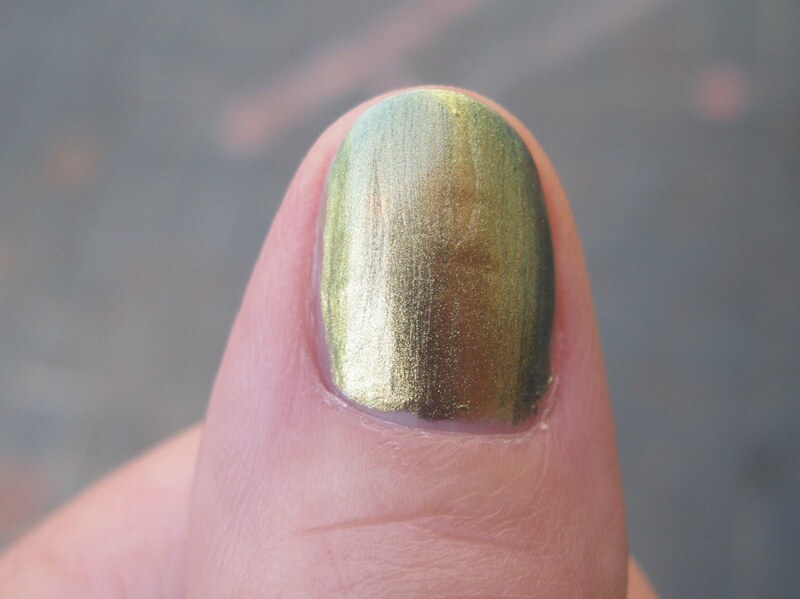 You don't see it as much on the nail, but I'm sure it's what's giving the green it's rich tone. Hi Paula, another OPI fan! Now I want to check out the shade YOU mentioned. I don't know what it is with nail polishes, I guess because I don't have that much money to buy clothes I feel like I can be up to date fashion-wise by buying the latest in nail colors. I know I've read on others' blogs' (Catherine at Aesthetic Alterations, for one, and Vahni at Grit & Glamour too) about nail polish as an accessory as much as a bag or a pair of shoes. I concur! Chanel nail polish Peridot look so pretty on you. Love the iridescence of the shade. My favorite nail polish right now is Tarina Tarantino Hypernova Nail Laquer in Empire, Starchild and Meteor Night. Hi JTWisdom, thank you for sharing that brand and all those colors. I'm going to Google them to have a look. That brand sounds mildly familiar but I'll have to find a place to buy it. I like my nails short (thank you real life) and love OPI Russian Navy on them. It is mysterious, changes with the light, subtle and fun. But now I want to track down Peridot! I have this too - I love the way it seems to change colour depending on the outfit you wear. For this reason it's so versatile!